I’m pretty sure it’s the hot and muggy weather that’s gotten to my cook gene, but I’ve been in a slump when it comes to meals. I mean, really, for the love of Pete, do you people have to eat every day, multiple times each day?! In my kitchen, we don’t have the dog days of summer; we’ve got the crab days. So, it was quite an unexpected gift – a Christmas in July, if you will – when I got on a food bender. I had been thinking a lot lately about how time flies – we’re already getting things together for the boys to go back to school – which sent me on the nostalgia engine to when I was a girl getting ready to go back to school. I will spare you the brain train that got me from that all the way to remembering things I loved most about summer dinners with the family … Dad would be grilling kebabs or pork chops or burgers and yelling at us to stop doing whatever we happened to be doing in the pool. Mr. Long would be next door swaying in his hammock smoking one of his stinky cigars, occasionally yelling a hello or random commentary on George’s grill skills over the fence. Bill would be across the street mowing his grass for the umpteen time staring daggers at us if we even thought about riding our bicycle near his property. And Mom would be inside whipping up the rest of dinner, probably grateful for the quiet. Most weekends, we would eat out on the patio in sopping wet bathing suits snarfling down corn on the cob dripping in butter and speckled with salt and pepper. There were usually sliced tomatoes from the farmers who would park their trucks along the sides of the road, never refrigerated or bruised from travel. Sometimes there was a rice or a pasta dish but if you were lucky and the stars aligned just right, Mom would make potato salad. We didn’t have the mayo/egg potato salad growing up (which we called regular potato salad oddly enough since our regular potato salad was this Italian version). Creamy but firm potatoes, crunchy vegetables, and the tang of vinegar and Dijon mustard with herbs … ah, memories. This is the perfect anytime/entertaining salad that can be whipped up early in the day while the kitchen won’t get too overheated by the boiling potatoes (yes, my kitchen is so small that boiling potatoes inches the thermostat up). If dinner is more than an hour or two off, I’ll put this in the refrigerator but this potato salad is far more suited to room-temperature than chilled. This, and it’s lack of mayonnaise, make it the perfect potluck or picnic side. Sitting out only makes it better. Here you go, enjoy my cooking bender while it lasts… a bit of my childhood in potato form. While the potatoes are boiling (can you envision this? ), finely dice all of the veggies and set aside. I always use inner celery stalks and their leaves – they add a nice crunch and flavor without the bitterness (to me) of the outer stalks. Mix the vinaigrette ingredients into the serving bowl so that you can toss the hot potatoes in. They absorb so much more flavor than if you wait until they have cooled. Time is of the essence! See how nicely the potatoes retain their shape even after tossing with the dressing? You don’t want mooshy potatoes. This is why you need to cube them before cooking so that each bite cooks through as opposed to a whole potato where by the time the inside is done, the outside is overdone. Since my photographer is not only a legend in her own mind but also a minimalist, I have very few useful photos. The Philistine didn’t even take a picture of the completed salad in the bowl. So, here’s another of just the potatoes, dressed and flecked with herbs. 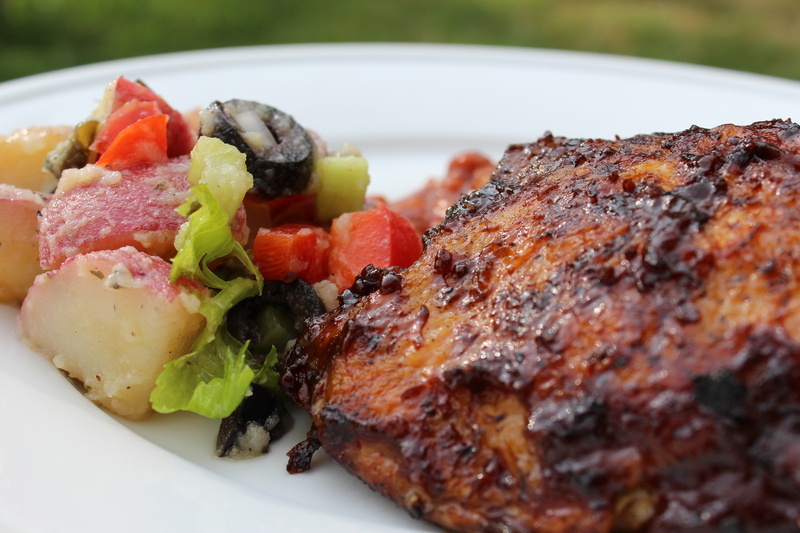 And here she is in all her potato glory aside a tasty bit o’ barbecued chicken. BD did a mighty fine job with that chicken… maybe he’ll share the recipe one day. One taste and I was transported back to the best barbecued chicken ever from Nick Hamilton (a story for another time, may God rest his wonderful, patient soul). Add the potato salad and I was in seventh heaven. 1. Put the cubed potatoes into plenty of cool water to cover and turn heat to high. Add 1-2 Tbs salt. Bring to a boil. Adjust heat to maintain a rolling boil but not a violent boil. The potatoes should take about 10-15 minutes from the time they come to a boil. I begin poking cubes with a sharp paring knife at about 7 minutes since I don’t know the age of the potato which affects cooking time. 2. 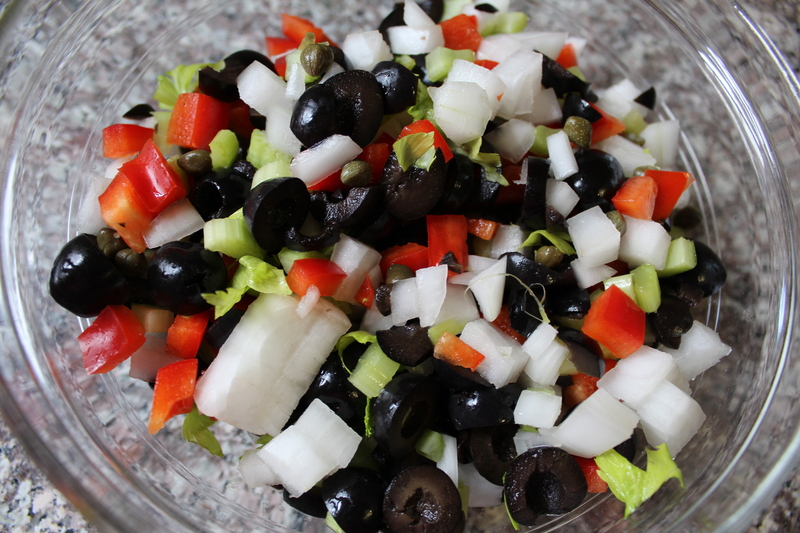 While the potatoes are coming to a boil, chop the vegetables and olives. Drain the capers. 3. Put the olive oil, red wine vinegar, Dijon, oregano and basil into the bowl you will be serving from. 4. As soon a knife will pierce three cubes of potatoes with little resistance, they are ready to drain. 5. Add the drained potatoes to the dressing ingredients in the serving bowl; toss gently. Salt and pepper to your taste; potatoes are pretty bland so it takes more than you’d think – I use about 1 Tbs of salt and 20 grinds of pepper. Let sit out on the counter for about 20 minutes until the potatoes are just warm (a quick toss every five minutes or so will help). 6. Add the chopped vegetables, olives, capers and parsley; toss gently. 7. Ready to serve! However, patience and about 1 or 2 hours let the flavors blend nicely. Beyond 2 hours, cover and refrigerate. There is no mayonnaise so safety isn’t an issue so it really can sit out longer. This entry was posted in Side Dish and tagged Barbecue, cookout, crowd favorite, delicious, family dinner, feed a crowd, Italian, Italian side dish, Make-Ahead, Nonnie, oil and vinegar, Picnic, Potato, potato salad, potluck, Side Dish, tradition, vegan, vegetarian. Bookmark the permalink. Love this! You could be a food editor. I am hungry from reading this and might try it with a grilled steak (if the weather holds out!). Peter, the weather is perfect for grilled steak and potato salad. Enjoy and let me know if it strikes a memory chord! And I would loovveee to work with food. From your lips to the industry’s ears. Thanks for the very kind words. I’m saving this one for later. I’ve been meaning to make this kind of potato salad for a while, and I just love the simplicity of your recipe. Nice! Love! The only potato salad–I’ve never been able to eat the “regular” version as I abhor mayo. Bee-yoo-ti-fool EOS!